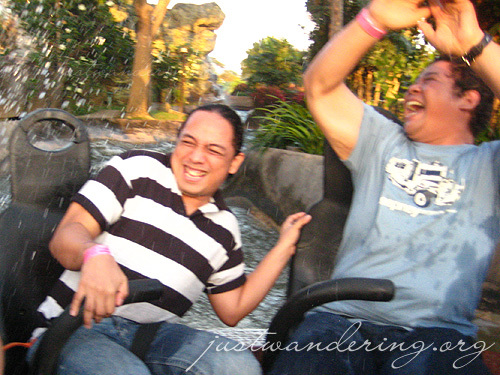 Enchanted Kingdom has been a mainstay in family outings, school field trips and barkada road trips. Since the park opened in 1994, I’ve been to the park twice with family, once on a field trip and thrice with my barkada. Though we don’t get to go to the theme park every year, each visit is as fun as the last one. Each trip has its own memories. The first time I went to the park with my cousins, I remember riding the Space Shuttle. I don’t remember much about the ride, but I do remember my knees shaking when I stepped out of the car. Once was enough for me, thank you very much. The first time I went with my friends , I remember this one guy grimacing in pain as the protective bar on the Anchors Away ride locked in too tigtly (his exact words were: “aray, aray, naipit ang b***g ko!”). Another time when I was at EK for a field trip, my classmates convinced me to ride at the last row of the ship, because it gets the most height during the ride. During the ride, however, while I was waving my hands in the air, my classmates were gripping the handle bars quite tightly. And they were all guys. Since then, the Anchor’s Away has been one of my favorite rides. 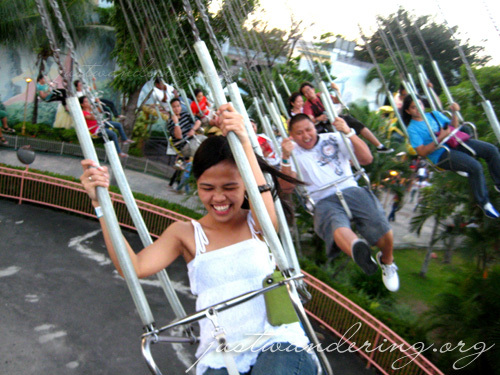 When I went with my immediate family, my mother and our driver rode the Flying Fiesta with me, my siblings and their kids. They thought it was just a swing and looked harmless. 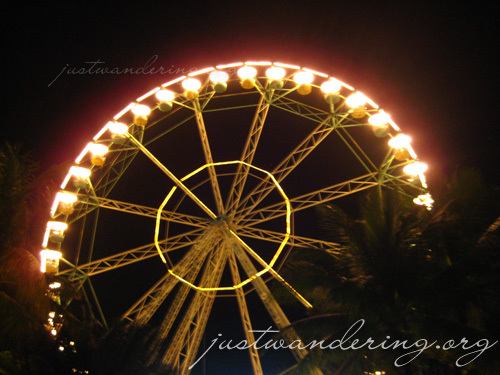 They were surprised when the seats rose high above the ground, and tilted as the ride went round and round. The driver never went on any ride after that. My mother, on the otherhand, was talked into riding the Jungle Log Jam with my dad. It’s just a boat ride, my sister said. She didn’t mention that there were two drops in the course of the ride. My friends and I visited EK again in 2002. A new ride has just opened, the Rio Grande Rapids. I already had an inkling of what kind of ride it was, having tried a similar ride in Jakarta years ago, but my friends had no idea they’d get drenched. Despite getting soaked, we had fun during the ride, an got some hilarious shots for posterity. 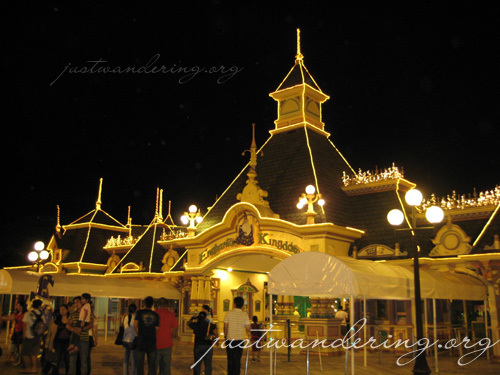 After such a long time, was able to visit Enchanted Kingdom again, this time with new and old friends. Though I’m now closer to 30 than 20 (eew), setting foot in the theme park again got me all giddy and excited like a child. There’s just something about EK that makes you forget about your worries and just live for the moment. We didn’t get to ride the Log Jam nor Anchor’s Away (definitely no Space Shuttle! 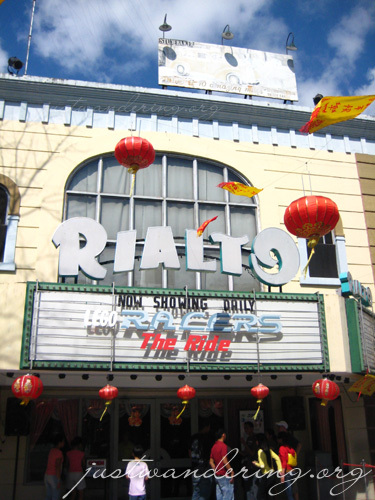 ), but we did manage to ride on some old time favorites: Rialto, Rio Grande, Flying Fiesta (always advisable to ride after the rapids to help you dry up quickly), Wheel of Fate, Roller Skater and Dodge ’em. We also get to race at the Kart Trak. Of course, in between there were much eating done. There were lots of new concessionaires at the park now: Hot Shot burgers, Dimsum ‘n Dumplings, Pita Mania Shawarma, Ice Monster, Potato Corner, Karate Kid and Pizza Hut. RELATED: Where are you headed this weekend? 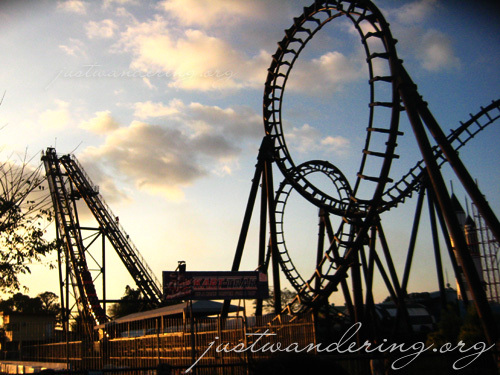 Enchanted Kingdom has always been a fun place to visit, and I’m happy that until now, it still is. i agree still as enchanting. kakatuwa picture sa rapids. 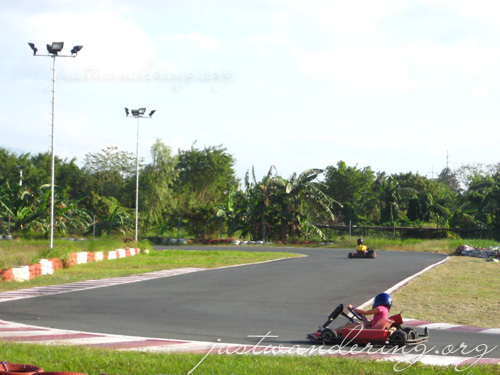 pero favorite ko dyan ang go kart! You’ve just convinced me to check out the place the next time we head to the Philippines. I’m a sucker for rabid roller coaster rides. ganda talga sa enchanted kingd0m lal0 sa ri0 grande kahit a mahaba ung pila sulit nmn tlgang basang basa aq ng b0ngang b0nga!!! para tl0y guz2 q ulit pumuntah dun!